The new Sharp MX copier range features an on-board motion sensor that speeds up your productivity by detecting anybody who may be approaching to wake up the MFP early, minimising the need to stand about waiting. An easy mode interface makes it super-easy for individuals to perform the basic tasks, such as copy, fax and scan, quickly, with large on-screen buttons and large text. An office is filled with many people and each one requires something different from a copier printer. The customisable home screen can be programmed for each individual. For example, if you're always scanning documents to send directly via email from the MFP, you can drag and drop that feature to the first section of the home screen. Direct office printing allows you to print office files, such as Word, Excel, or PowerPoint via a USB drive. Work anywhere at any time, these WiFi enabled devices plus Sharpdesk Mobile offer mobile connectivity to let everyone print from and scan to their phones, tablets and other mobile devices over your wireless network. Digitising documents is great for archiving, but making them searchable is something that can only be done with optical character recognition. Sharp's latest MFP's support OCR. With print release you don't need to wait for an occupied copier printer that may be printing dozens of sheets; that can takes ages. 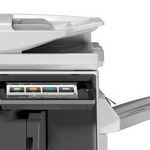 Instead, the document you wish to print is stored on a centralised MFP and can be pulled to another printer that's free. On top of that, if you opt for any of Sharp's award winning software solutions, you'll have access to optimised scanning, printing, and storage features, that'll help drive growth by speeding up a whole range of document related admin processes. Find out more about the new range of Sharp multi-functional printers for business in our photocopiers section. For more information about renting, leasing or buying an MFP, the software solutions available or for photocopier support, please contact us today. We'll be happy to help.